Bombs kill at least 40 as Baghdad sees end of decade-old curfew. Baghdad’s decade-old nightly curfew ended after midnight on Sunday, hours after bombs exploded in and around the Iraqi capital, killing at least 40 people in a stark warning of the dangers still ahead in this country under attack by the Islamic State group. The deadliest of Saturday’s bombings happened in the capital’s New Baghdad neighbourhood, where a suicide bomber detonated his explosives in a street filled with hardware stores and a restaurant, killing 22 people, police said. The Islamic State group later claimed responsibility for the attack, saying the bomber targeted Shias, according to the SITE Intelligence Group, a US-based terrorism monitor. The Sunni extremists now hold a third of both Iraq and neighbouring Syria in their self-declared caliphate. A second attack happened in central Baghdad’s popular Shorja market, where two bombs some 25 metres apart exploded, killing at least 11 people, police said. Another bombing at the Abu Cheer outdoor market in south-western Baghdad killed at least four people, police said. In Tarmiya, a Sunni town 30 miles north of Baghdad, a bomb blast killed at least three soldiers in a passing convoy, authorities said. Hospital officials confirmed the casualty figures. All officials spoke on condition of anonymity as they were not authorised to brief journalists. No group claimed the other attacks. Despite the bombings, the government went ahead with its plans to lift the nightly midnight-to-5am. curfew on Sunday. 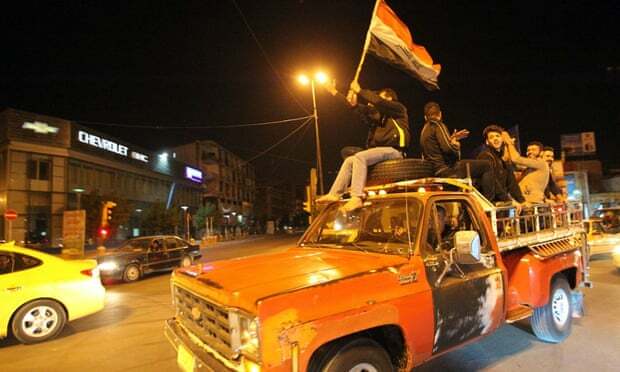 The curfew largely had been in place since 2004, in response to the growing sectarian violence that engulfed Iraq after the US-led invasion a year earlier. A crowd of men, women and even children played music and waved Iraqi flags early on Sunday as they gathered amid a heavy security presence in central Baghdad’s Tahrir Square to celebrate the curfew’s end. Elsewhere, small groups of young men rode around the capital early Sunday on motorcycles and in cars, cheering and waving Iraqi flags. There was no immediate comment Saturday from Prime Minister Haider al-Abadi, who on Thursday announced plans to end the curfew by decree. He also ordered that streets long blocked off for security reasons reopen for traffic and pedestrians. Iraqi officials have repeatedly assured residents that the capital is secure, despite Sunni militants routinely attacking Baghdad’s Shia-majority neighbourhoods.